Southwest Airlines shareholder meeting took place in Chicago on May 18, 2016. 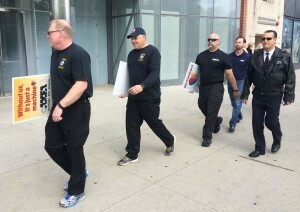 This meeting was confronted by a protest by pilots, staff and mechanics for unfair work conditions. Southwest Airlines also has a history of discrimination against Muslims (see links below). 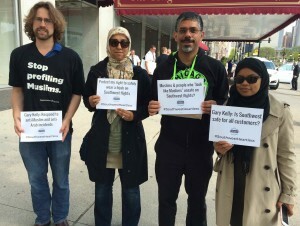 Members of Movement to End Racism and Islamophobia, the Center for New Community, Jewish Voice for Peace – Chicago and Muslim American Society – Chicago joined the protest. “Khairuldeen Makhzoomi, a senior at the university, was removed from the Oakland-bound flight from Los Angeles international airport on 6 April. Makhzoomi, 26, was born in Iraq, and his family fled the country in 2002 after his diplomat father was killed by Saddam Hussein’s regime. “A hijab-clad Muslim woman in the US was reportedly removed from a Southwest Airlines plane after she asked for switching seats with a flight attendant saying she “did not feel comfortable” with the passenger. Hakima Abdulle, a Muslim woman from Maryland, said she was removed from the flight from Chicago to Seattle “without any credible explanation”. 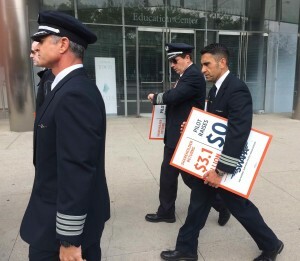 “From North Carolina, Manzoor Cheema, a member of the Movement to End Racism and Islamophobia, made the connection between the protestors and the pilots, flight attendants, and mechanics picketing for better pay, benefits, and working conditions.